Bunnies, Chicks and Eggs...Oh My! Nothing says Easter like fresh Spring flowers, yummy treats and kiddos running around outside searching for hidden eggs. I love Easter, especially since having kids. Spring used to be my least favorite season, growing up in Washington the season was generally full of rain. While stores filled with brightly colored items from home decor to clothes, it never felt quite warm enough to embrace the season. However, it has now become one of my favorite times of year. I have come to appreciate the rain. It has given us nice green grass, flowers blooming in the garden and when we do get those sunny Spring days, nothing is more beautiful than this place I call home. We have been blessed these past few Easter holidays with beautiful weather! 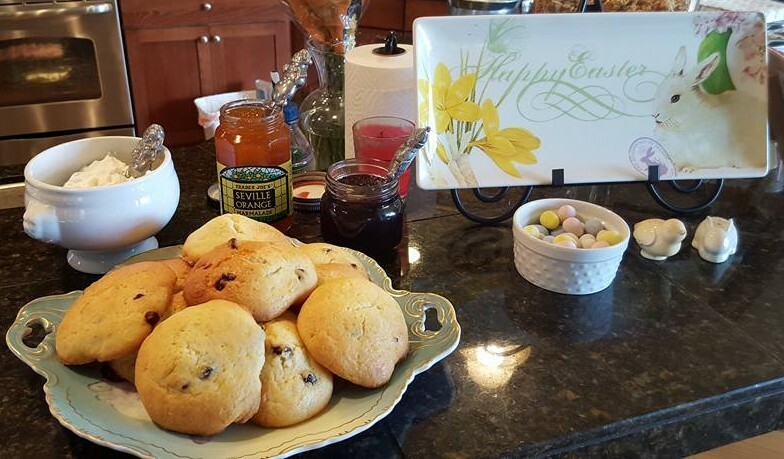 Below is a flashback of last year's Easter festivities and how we celebrated this year. Our Easter table was kept quite simple, with blue mason jars and brightly colored tulips. My husband made rice krispie eggs, with a hidden chocolate candy inside. I am a sucker for rice krispie treats, so delicious! Each year we ask my husband's aunt and cousin to bring the deviled eggs, a true Easter staple. They never disappoint! I tried my hand at making homemade cinnamon rolls. They were so good, I can't even begin to describe the deliciousness of these perfectly gooey cinnamon treats. I used the recipe from The Slow Roasted Italian Blog, get the recipe here. For this past Easter we decided to host a potluck style brunch again, which is my favorite, and everyone else seems to really enjoy it as well. Love all the breakfast goodies mixed with the yummy treats! I had recently attended a floral arrangement workshop taught by Country Bouquets Floral and hosted by Jenny Cookies. This is the first arrangement I tried on my own, and I am so happy with the results. I purchased a couple of store bought bouquets, snipped a few sprigs from my yard for extra filler and ta-da! The dessert spread. Banana muffins, rice krispie sandwich treats, sugar cookies and mini pancakes for the kiddos. Stacked banana muffins on cake plates and added some cute Easter toppers. Mini pancakes with cute toppers for the kiddos to enjoy. Sugar cookies that all the kids couldn't wait to sink their teeth into. Who am I kidding? I love these as much as they do! Best recipe ever and super easy instructions, recipe from Eat More Dessert by Jenny Keller. Highly recommend it! Best rice krispie treat I have had yet! For directions on how I did these yummy treats, see my blog post here. Scones, a family favorite, doesn't matter what kind I will eat them all! This scone recipe is super special because it is the same one served at The Empress in Victoria. (For my post on my most recent trip to Victoria see here.) You can get the recipe for this scone here. Served with your favorite jam and whipped butter, perfect accompaniment to brunch. 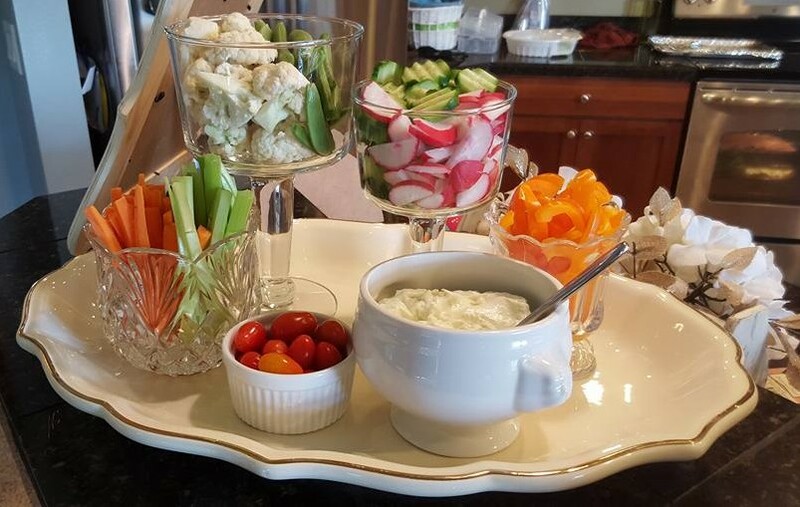 Vegetable platter designed by my momma. Gotta have a little something healthy mixed with all that sugar. Yogurt Bar: Greek plain yogurt with honey or brown sugar to sweeten. 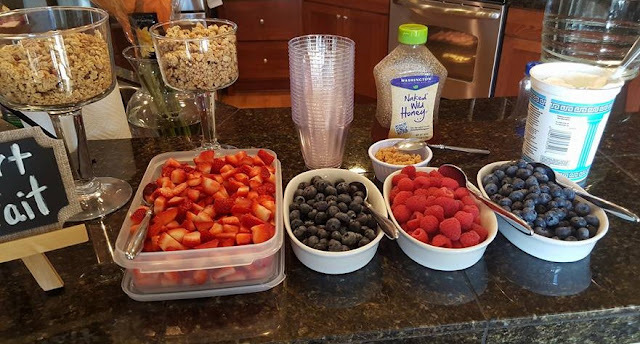 Top with your choice of berries and granola.